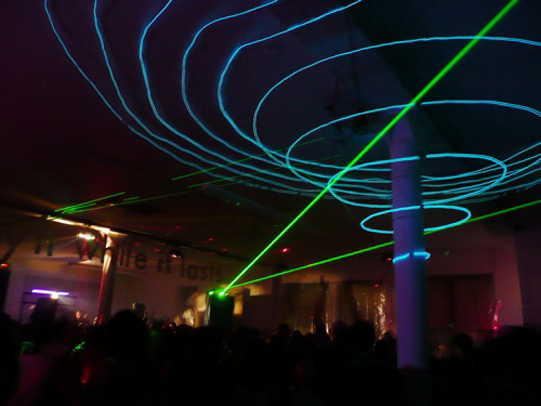 The Light Ripple is an interactive light sculpture intended for large, late-night social gatherings dominated by blaring sound systems, steady beats, and free-flowing social lubricants. The interaction model is simple: one button, when pressed, initiates a sequence of concentric rings of electric blue light that starts at eye level and spreads onto the ceiling. Instead of shaping or defining the space, the Light Ripple interrupts the space, briefly creating a shared experience as it spreads to 200 square feet over the crowd. Despite its simplicity, the sculpture rewards interaction on several levels. Its immediate appeal is its instant gratification: the ability to control hundreds of feet of bright flashing light at the touch of a button. But the briefness of the result (the entire sequence lasts one fifth of a second) encourages repeated interaction, creating new opportunities for participants to respond to the night’s rhythms. Most interesting (and least apparent) is how knowledge of the Light Ripple’s interaction model becomes a social currency. The only clue to the sculpture’s operation is a small lighted push-button which is easy to overlook in the chaotic environment. Possessors of this knowledge exhibit how “in the know” they are and increase their perceived social value by sharing the secret with their peers, which perpetuates interaction with the sculpture throughout the night.